Zeus was cowering in the corner and the Metrolian trooper had powered up his gun. “Say goodbye, you pitiful life form,” said the trooper angrily. A gunshot then sounded and a bullet pierced the trooper’s body. He then looked down at his chest and saw that he was bleeding blue blood. The trooper then dropped dead. Simon appeared with a gun. Behind him followed Chucky, Cathy and Carol. “Simon? Why are you and Chucky coming to save my life?” asked Zeus. “We’re not here to save your life, professor. Only to rescue Dave,” stated Chucky. Zeus then looked at the girls. “Who are they?” asked Zeus. “These two girls informed us about the Metrolians before they invaded” explained Simon. “Is Dave ok?” asked Carol. Simon then went to check on Dave. “He’s unconscious. I better get him back to the house” he stated. “Where did Charles go?” asked Cathy. “I don’t know. I’ll contact him,” said Chucky. Charles crept his way around the transport ship. He could see hundreds of Metrolian troopers as they prepared for the invasion. “How can I defeat these guys?” he thought. “Charles, Where are you?” asked Chucky through the communicator. “Keep it Quiet, Chucky. I’m on the transport ship,” stated Charles through his communicator. Lots of Metrolian troopers heard Charles and charged to his location. He had no choice but to fight them off. He got his guns out and started to shoot them. Lots of Metrolian troopers died in front of him but hundreds more arrived. Charles then started to run. He ended up in the ship’s engine room. Metrolian troopers closed in on him. The engines started to sound. “What’s that noise?” asked Charles. “It’s the ship taking off,” said the Metrolian general as he entered the room. “I say, you’ve put up quite a fight there, boy. I had to give up hope of examining this planet. I have ceased any attempts to conquer it… for now!” stated the Metrolian general. “Are you the leader here?” asked Charles angrily. “Of this platoon, yes. But not of the great Metrolian Empire, I’m afraid” explained the general. “What are your intentions?” asked Charles. “Why, to enslave the entire universe of course. You’ve just simply delayed the inevitable for this planet. I’ll return with a bigger army and silence you forever!” explained the general confidently. Charles removed a pin from a grenade and threw the grenade in the engine core. The Metrolians then gasped in fear. “See you in hell!” shouted Charles as he ran for the window. Charles then broke through the window and started to fall. The transport ship then exploded. From the ground, Simon, Chucky, Cathy and Carol could see the explosion. “Oh my god! Is Charles ok?” asked Simon fearfully. “I’ll check through the communicator. Charles, can you hear me?” asked Chucky through his communicator. “Loud and clear, Chucky” said Charles through the communicator. Chucky then sighed with relief. “Are you ok?” asked Chucky through his communicator. “I need a little help,” said Charles. “Where are you?” asked Chucky. “About 10,000 feet above you and closing in” stated Charles. They then look up and could virtually see Charles as he fell towards him. “Oh my god! What can we do?” asked Simon fearfully. Cathy then stood forward. Her bracelet started to glow. Simon and Chucky looked surprised and awestruck. Cathy then grew wings. “I’ll rescue him,” she said as she took off. She closed in and caught Charles. “Whew! Thanks Chuc… Cathy?” asked Charles surprisingly. “It’s alright, Charles. You’re safe now,” stated Cathy. Cathy and Charles landed safely onto the ground a few seconds later. Cathy’s bracelet glowed again and her wings disappeared. Chucky and Simon still looked awestruck on what just happened. “Alright! What the hell is really going on here?” asked Simon. “We’ll explain everything soon” said Carol. “Lets head back for the house and check on the others,” suggested Charles. They all headed back to the house. Simon, Charles, Chucky, Cathy and Carol arrived at the house. “Charles, You’re ok? I thought you died in that explosion,” stated Vicky with relief as she hugged him. “I’m fine, Vicky, don’t worry” said Charles as he tried to calm her down. “How’s Dave doing?” asked Simon. “I’m fine. Just a bit of a headache” groaned Dave. “When did he wake up?” asked Chucky. “About ten minutes ago” said Helen. “Where is that Metrolian git? I want to make mince meat out of him!” stated Dave angrily. “I killed him,” said Simon. “Oh. And the invasion force?” asked Dave. “I blew them up,” said Charles. “You have all the fun, Charles” frowned Dave. “Ok, I think we should get back to the matter here,” stated Simon. They all then turned to Cathy and Carol. “Who are you, girls, and how did you manage to grow wings like that?” asked Simon. “Very well, if you must know. We’re Polymorphs” stated Carol. “Polymorphs?” said Vicky in shock. “Yeah. We were once a peaceful people, living in harmony. That was until the Metrolians invaded our space. We had been fighting them for centuries, but as each year passed, they grew stronger and stronger” explained Carol. “We were sent from our home world to warn other races of the Metrolian threat so they can prepare themselves and stand a fighting chance against them” explained Cathy. “We had being travelling for months on warning other alien races of their demise, until we were attacked by a Metrolian battleship” explained Carol. “We managed to escape their attack but we had to land our ship to the nearest planet and make repairs” explained Cathy. “Yep. But as we got closer into the atmosphere, some small gaseous explosions interfered with our sensors and damaged our hull and we crash-landed” explained Carol. 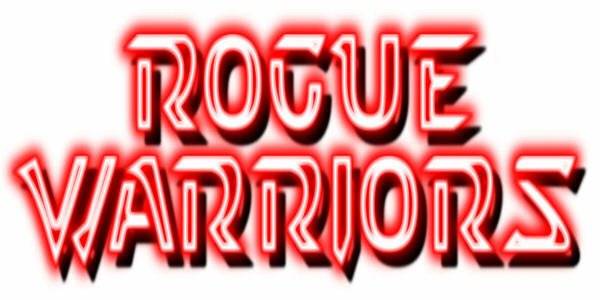 The Rogue Warriors looked at each other and felt embarrassed. “Th- that was kind of our fault” said Charles embarrassingly. “How was it your fault?” asked Cathy confusingly. “Those gaseous explosions were our firework display,” explained Simon. “WHAT! ?” yelled Cathy and Carol. “YOU COULD’VE KILLED US! !” yelled Cathy with anger. “We’re sorry. We didn’t know that you’re crash-landing on our planet,” explained Vicky. Carol then took a deep breath and held on to Cathy to prevent her from attacking someone. “You polymorphs can change shape, right?” asked Dave. “Yes” said Cathy as she calmed herself down. “Then how come you both look, well, humanoid?” asked Dave. “This is our normal form. We can only change shape with this bracelet. It is magical. It was given to us when we were born” explained Cathy. “So, if you remove the bracelet, you cannot change shape?” asked Chucky. “I’m afraid so” said Cathy. “But what if the bracelet is destroyed? Won’t you get a new one?” asked Simon. “No, because the bracelets are virtually indestructible” explained Carol. They all paused for another moment. Carol and Cathy thought for a moment and then both took a deep breath. “You guys seem to be a powerful group and since you’ve heard our problem, will you help us destroy their empire?” asked Cathy. “Hold on. You’re asking us to join you in a war that we can’t possibly win” protested Simon. “There’s only eight of us and possibly millions of Metrolians, They would kill us in a matter of seconds” stated Chucky. “Yeah, but we fight in wars like this all the time, guys” stated Charles. “Yeah, but the odds have never been stacked this highly against us!” protested Simon. “Come on, Simon. We always manage to find a way to turn the tables against us. This will be no different,” explained Helen . “Well then it’s settled, we can help other alien races while killing the Metrolians,” stated Dave happily. “So then, are you going to help us?” asked Cathy and Carol with hope. “We’ll gladly help you save the universe from the Metrolians” stated Charles. “Great, except one thing,” said Vicky. “WE DON’T HAVE A BLOODY SPACESHIP!! !” yelled Vicky. “On the contrary, Vicky, we do,” said Chucky. “Follow me everyone, I’ve got something to show you” stated Chucky. They all followed Chucky to a hanger. He turned on the bay lights and revealed a large spaceship. The others looked amazed. “That’s a fancy ship,” said Helen. “Thanks. Charles and me have been working on this for a few years. We were going to use this in case Zeus was attacking from space,” explained Chucky. “You guys built it?” asked Dave. “Yep. It was hard work, I could tell ya,” said Charles as he scratched his head. “Yeah. We had to test this thing out a few times a couple of months back, but it finally works. I call it, the Enterprise,” said Chucky. Simon then turned to Chucky. “The Enterprise?” asked Simon with a weird look on his face. “Yeah, what’s wrong with that?” asked Chucky. “You’ve been watching way too many Star Trek shows back on Earth, haven’t you?” teased Simon. “Hey, it’s just a name. It’s not like the producers will come and sue us,” stated Chucky as they walked inside. Cathy and Carol then looked at each other with confusion. “What’s Star Trek, Carol?” asked Cathy. “I don’t know. They’re strange creatures we’ve found there, Cathy” stated Carol. “I hope we’re not making a big mistake by allowing them to help us,” stated Cathy as they walked inside. A few minutes later, the Enterprise took off and they headed for the far reaches of space.